Visit the global Politics » Bills & laws archives for posts from all DGR sites. The state of Hawai’i is set to pass pioneering legislation to ban the sale of sunscreens containing oxybenzone or octinoxate, chemicals especially dangerous to the health of humans and oceans. This is a small but valuable move towards alleviating the assault on our oceans. We need much more, but we should celebrate even the small victories, using them as motivation to keep aiming higher. The ban doesn’t take effect until 2021, so if you use sunscreen, please take the time to understand the ingredients. Switch to a product safer to reefs if your sunscreen is harmful, and let the manufacturers know why you’re making the change. Local filmmakers and activists Malina Fagan and Lynn Pelletier have produced a five minute video explaining the dangers of oxybenzone. View it below, download their reef safe sunscreen guide (PDF), or learn more from their Reefs At Risk website. Please share these resources with anyone concerned about our oceans! This entry was posted in Lobbying, Toxification and tagged Bills & laws, Hawai'i, Oceans on June 8, 2018 by Norris Thomlinson. The islands of Hawai’i, especially Kauai, are frequently described as “ground zero” for GMOs. As an unwilling host to parasitic chemical agriculture, the land is bombarded with pesticides and chemicals at concentrations unseen in most other places; the test and seed crops grown by agribusiness can be dosed at much higher levels than crops meant to be eaten. The effects on the aina and its people are predictable: sterilization of the soil, massive pollution of the waters, and widespread negative impacts on human health. Though much of this harm is inherent to agriculture, even organic agriculture, the severity is drastically worse in these modern operations. It operates from a framework of limiting, but still permitting, the companies to poison and destroy life, rather than establishing a normative expectation of healthy landbases and sustainable operations, with all actions evaluated against that. It doesn’t proactively address the constitutional structure in place in the US, deliberately set up to facilitate corporate extraction of resources. Under the hierarchy of preemption, local municipalities are explicitly denied the power to enforce protections stricter than those allowed by the state and federal governments. Unsurprisingly, agribusiness immediately used the court system to strike down most of the restrictions fought for and won by the people. 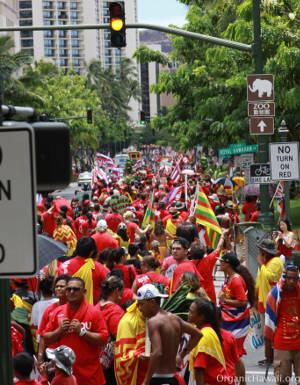 The response by the people in early August was the “Aloha Aina Unity March” through the streets of Honolulu to protest the diverse manifestations of civilization in the islands, including pesticides, the TMT construction project, lack of home rule, and militarization. Though it roused an impressive turnout of 10,000, this sort of symbolic protest is unlikely to be effective without organization into a credible threat to those in power. Simply asking them nicely to do the right thing won’t get us anywhere. A more strategic approach via the legal system is offered by the Community Environmental Legal Defense Fund (CELDF). They help localities draft bills declaring and enforcing the rights of communities and of nature against corporations. Their tactics expect and leverage legal challenges to the passage of such bills, using any pushback to highlight the undemocratic nature of our system, galvanizing and radicalizing further opposition. A CELDF representative visited multiple islands in 2013, presenting their strategy and offering assistance if a group on the ground wanted to put forward a bill or initiative. That remains as a promising possibility if anyone wants to organize towards it. 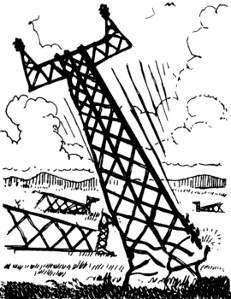 Another approach is that advocated by Deep Green Resistance: trace all these problems back to the root problem of civilization, especially industrial civilization. While strengthening local communities and rebuilding sustainable practices, work to end the ability of the rich to steal from the poor, and of the powerful to destroy the planet. Given the small number of people willing to question civilization, let alone confront it, and given the desperately short timeline we face before the planet is pushed to irreversible and catastrophic collapse of its life support systems, DGR believes it necessary for some people to carry out direct attacks on critical infrastructure. By disrupting the underpinnings of systems of control, including communications, energy transportation, and electrical distribution, hypothetical underground groups would directly erode the power of those working against life, and make them more likely to concede to demands by the more “reasonable” of us in aboveground groups. These conveniences come with costs usually unseen until we actively investigate: exploitation and murder of life here and abroad, human and non-human, in the present and in generations to come. Nothing civilization can give us is worth the death of the planet. Hawaiians lived good lives here for centuries before European contact. Depending on what you most value ― family, intimate connection to community & aina, a clean environment, and meaningful work; or short-lived labor-saving devices, fleeting visits to places far and wide, and flashy gadgets ― one could argue Hawaiians lived much better lives than we do now. Subscribe to this blog by entering your email at the top right of this page. Share this article and other DGR pieces you find interesting with family and friends. Fill out our Volunteer for DGR form or our Join DGR form. This entry was posted in Agriculture, Building Alternatives, Indirect Action, Strategy & Analysis and tagged Bills & laws, CELDF, Courts, Pesticides, 11: Civilization is a culture of occupation on August 30, 2015 by Norris Thomlinson. The Hawai’i Sustainable Community Alliance has put a lot of effort over the past few years into drafting, introducing, and lobbying for a bill to “enable innovators and sustainable pioneers to practice and test ways of living that are ecological and sustainable” in Hawaii. The bill passed through 6 committee hearings, and normally would have proceeded automatically to a final hearing. Senator Malama Solomon, who generally seems opposed to sustainability and supportive of destructive practices like industrial agriculture and geothermal, used her position as Chairperson of the Senate Conference Committee to deny the bill a hearing. This, of course, is an all too typical expression of how systems of power operate. If you don’t play by their rules, they imprison you. If you play by their rules, you generally have no chance of winning, because they wrote the rules to keep themselves in power. And if you play by their rules and start to win, they change the rules. If we, as advocates of sustainable living and social justice, are serious about winning, we need to find ways out of this triple bind. The Deep Green Resistance strategy of Decisive Ecological Warfare is an excellent start, though we’ll have to figure out how to effectively apply it the particular situation in and needs of Hawaii. This entry was posted in Lobbying and tagged Bills & laws on May 9, 2014 by Norris Thomlinson.